For this month, I have to choose the Diana Fountain, by E. J. Clack dating from 1954, even though it is well outside the period covered by these pages, simply because it is so timely to mention it. 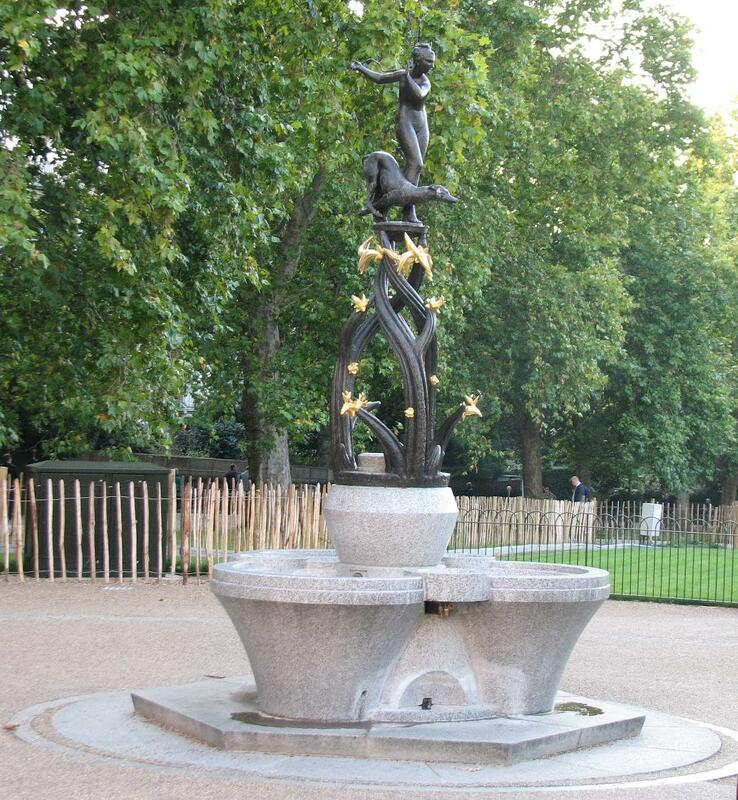 With some stroke of inspiration, the powers that be have moved the Diana Fountain to its new position by the park entrance to Green Park Station, which opened just a few weeks ago. The fountain used to stand along one of the paths cutting across Green Park, and given that most people simply walk across the one end, to get between Piccadilly and Buckingham Palace, or go along the southern edge, this sculpture was rather for the connoisseurs of Green Park rather than likely to be seen by the casual visitor. Anyway, in its new position, many commuters will see it every day, and many tourists too. 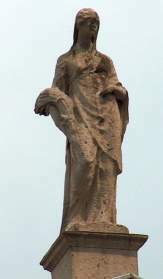 The view of the statue for those leaving the station into the park is the right one – we see Diana in ¾ view, her face and feet twisted to the right, her upper body facing us, her arm stretched back elegantly. The supple curved back of her dog emphasises the curves of the girlish figure above and behind. Atop a fountain, thus designed to be walked around, the group needs to look aesthetic from a variety of directions, and the view of her back, shown below, is also excellent. The gilding of the floralities below is new; previously there was no gilding, but it works well. 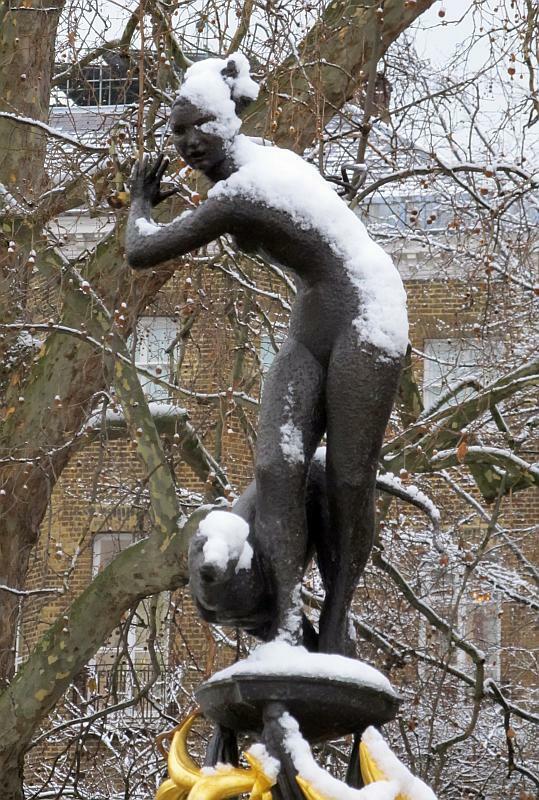 And the picture below right shows how attractive the statue looks in a different season, with snow. I knew only this single work by Clack, and nothing of the sculptor, who is outside my period. A web search shows he was more of a wood carver than a sculptor per se. Apart from the Diana fountain, we also have a work Adam and Eve in Wells cathedral, and his other commissions seem to have included various religious pieces as well as a couple of nudes not particularly related to the Diana. The Passing of the Spirit, by Dyson Smith. In style, the statue is concerned with pose and grace and elegance, not mass at all. It recollects to me the lovely statue by the library in Watford, a work by C. W. Dyson Smith called The Passing of the Spirit , dating from 20 years earlier, and other work from the 1930s by Charles Wheeler. 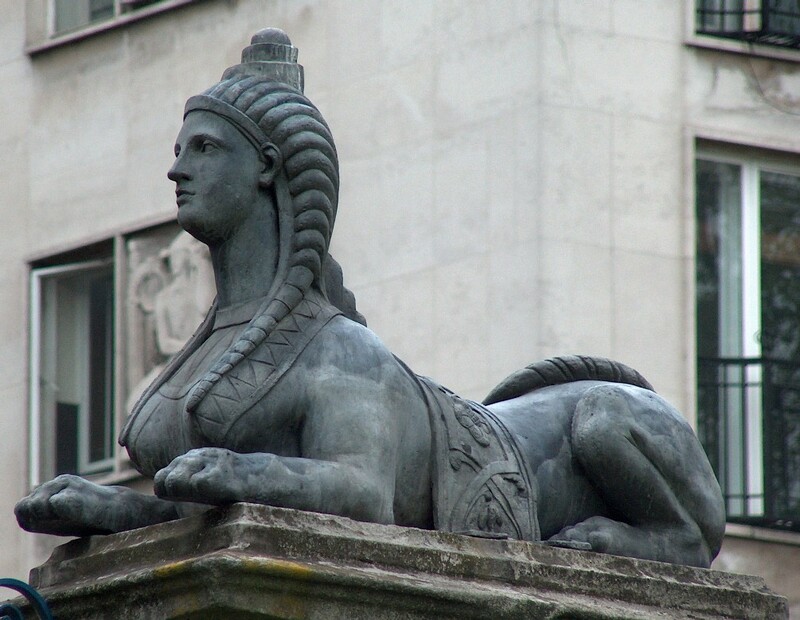 The statue was the gift of a fund set up by the widow of Sigismund Goetze, familiar through other fountains and sculptural works, including a large fountain in Regent's Park by Wheeler, and a small statue in Marylebone gardens. 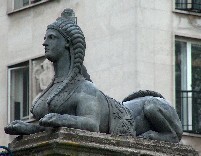 One of a pair of sphinxes, by Cheere. 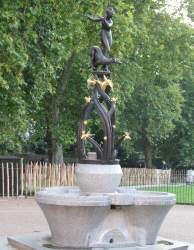 There are no more statues quite within Green Park, though once it was the site of a work called Rima by Epstein, and there is a modern fountain with maple leaves forming a Canadian war memorial to honour the soldiers who died in WW2. However, around the periphery of the park we have good sculptural things. A gate on the northern side of the park bears two sphinxes, 18th Century work by Cheere, I think (for more statues of sphinxes, see this page). 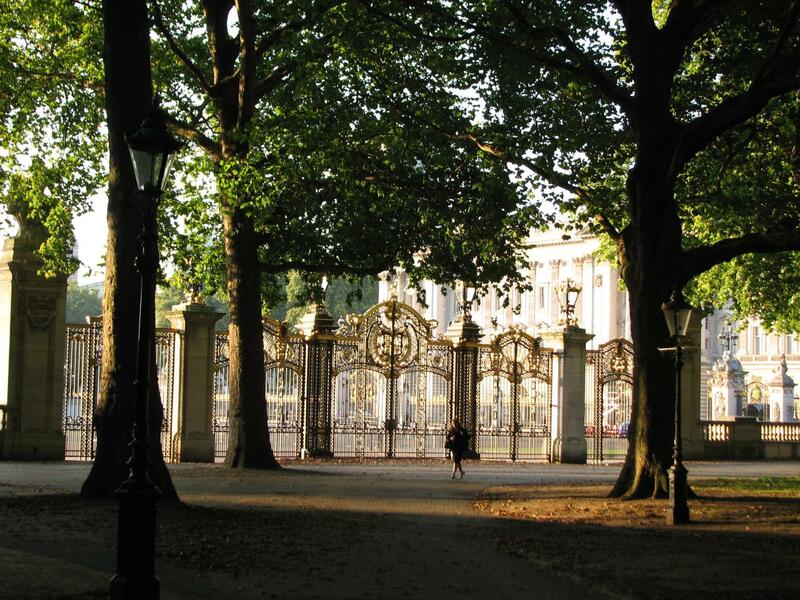 Best seen from just within the park, near to opposite that gate, is no 101-4 Piccadilly, now occupied by the Japanese Embassy, with excellent, though sadly anonymous, sculptural decoration – see the Piccadilly page. To the west, we have Constitution Arch and then across the busy road, the various statues at this end of Hyde Park, with Westmacott’s Achilles dominating. See this page. To the east, we may note the three much decayed stone statues on top of one of the great mansions, Spencer House, that flank this side of the park. Stone statue atop Spencer House. Finally, to the south of the park, of course, is the Victoria Memorial in front of Buckingham Palace. 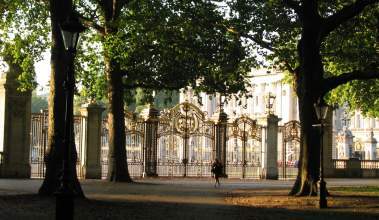 Green Park Gates, south side of the park, Buckingham Palace behind. For a very brief discussion of some other Diana statues, see the page on Feodora von Gleichen's Diana the Huntress.